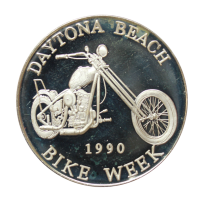 Here's the perfect gift for a biker- vintage Daytona Bike Week commemorative silver rounds! 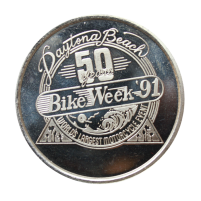 We have the 1990 Daytona Bike Week silver round, featuring a classic chopper, and the 1991 Daytona Bike Week 50th Anniversary silver round, featuring the special 50th Anniversary logo. Each of these collector's items are made from 99.9% pure silver.